I’ve been baking for days in preparation for this weekend. Monday, I’ll take ten boxes to the post office, each filled with bubble wrap and packing peanuts (boxes and filler are all recycled from packages received) protecting cookie tins and little gifties. Bags of granola. Jars of jam. Squat pint jars for my pals who love sweet pickles. Slivovitz and limoncello. In some of the boxes, I’ll be including a big bag of Nuts ‘n’ Bolts, one of those crazy, retro holiday traditions. Our first Christmas together, thirteen years ago, a giant box arrived the week before Christmas. Dennis’ eyes lit up and he gleefully declared “Nuts & Bolts!” That year, and for a few after, Aunt Dorothy sent a huge coffee can filled with this savory treat, as well as two or three pieces of her hand painted china. Aunt Dorothy’s been gone for a couple of years now. We think of her often, her gentle nature, crossword puzzling, I Love Lucy watching, and appreciation of the world at large. For awhile, she and I corresponded, hand written letters with news and thoughts of baking or gardening or her Denny, whom she adored. Making Nuts & Bolts brings her back to our hearts every Christmas. This is a tasty, savory, snacking food – utterly addictive. Make a huge batch, pack it up in jars or bags tied with a bow. Take it along with you to a holiday party and watch what happens. Start a tradition of your own. Empty the cereals, pretzels and nuts into a huge bowl. In a small saucepan, heat the butter, oil and Worchestershire sauce until the butter is completely melted. Add the spices to the melted butter/oil/sauce mixture, stir well, and pour over the cereals/pretzels/nuts. Mix well but very gently using two big spoons or your impeccably clean hands. Spread the mixture over the two baking sheets or into the roasting pan. Bake for about two hours, stirring gently every half hour or so. Allow the mixture to cool completely before packing it into big decorative bags, tied with a bow. Or, do as Aunt Dorothy did, and use giant ChocFullofNuts coffee cans. Send some Nuts & Bolts to all your loved ones. Does your family have a favorite, traditional, holiday treat? Tell me about it in the comments! I’ll randomly select one of you to receive a holiday package from my kitchen. Candy, cookies, jams, pickles, booze, nuts & bolts – might be any of the above! US residents only. I’ll mail on Wednesday, with hopes it might get to you before Christmas, so you only have until Tuesday, December 20, 9PM EST to enter to win. Happiest of holidays to all of you. 2 things. One very San Francisco. Our traditional Christmas dinner is cracked crab and garlic bread. Copious amounts of crab and butter. My kids adore it and can’t wait. I also make a very retro cookie (same feel as “Nuts and Bolts” – that kind of retro. ) It’s called Chocolate Diamonds. Basically it’s a shortbread crust made with brown sugar, Hershey bars melted on top (a nice thick layer) with a scattering of toasted walnuts on top. Cut into diamonds when cool. Hershey bars = very retro, but the whole is greater than the sum…well you get my drift. Enjoy all the baking everyone! 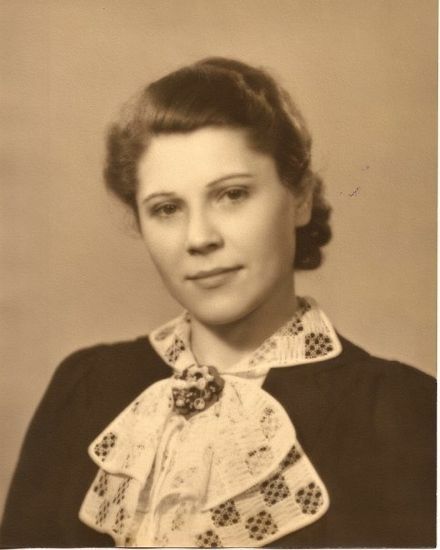 Wow…Aunt Dorothy was a beauty. Hard to narrow it down the favorite treat, becasue there are so many, so I would have to pick a category: cookies. It all started with gift box of cookies from a neighbor when we were kids…a huge variety of delicious home made cookies, buttery sugary Christmas heaven. Not exactly a treat but every Christmas Eve, the dinner includes homemade pierogie. Somethings change, but not the pierogie. My wife’s aunt and uncle used to make them all themselves. Legend has it that is was an all day affair and they weren’t on speaking terms at the end of the day. Now, it is a family affair, usually on Veteran’s Day. We make the filling then Aunt Carol makes batches dough. I roll it and cut it. My wife, her sisters and kids stuff them. Uncle Lou and my brother-in-law are in charge of the boiling. We were are done cooking, we all have a pizza lunch together. The pierogie get frozen and they are fried up for Christmas Eve. I still remember the batch she used to make “special” for my mom without peanuts and made sure the bowl that sat next to her chair on christmas day was peanut-free too. She was the most loving and caring woman I have ever known. I will miss her always! thank you for the recipe share, I was too young to think she would one day not be here to ask, but i look forward to trying it out! My boyfriend’s family tradition at the holidays is Jamaican Black Cake. A few years ago their favorite Jamaican cook retired and they stopped getting it for a bit. Last year I found a good recipe and after asking about some of their memories of how it was made in Jamaica. I made a few tweaks and have been making it for them for two years now. I am learning how to make it better every year! I’ve had that Black Cake and it is so divine it’s almost sinful. We make something very similar to Nuts and Bolts, only we call it Texas Trash. So delicious. What I love about making my own Nuts and Bolts? 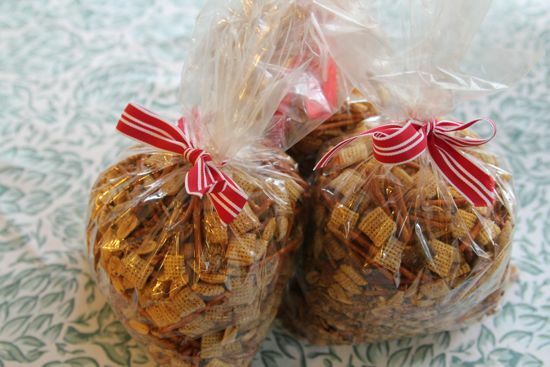 Not having them be so heavy on the pretzels as the prepared stuff is; I LOVE the Chex! My favorite and traditional holiday treat are from my Grandmother. I made them with her as a young girl, helped my mom make them too and have made these cookies,well, I can’t remember not making them actually. I always include some Pecan Butter Balls (some people call them Mexican Wedding cookies or Russian Tea Cakes but I’ve research and the plain and simple Pecan Butter Balls are more Scandanavian…and that was my Grandma!) in gift packages I make for the holidays; I think my Dad, her son, looks forward to them the most. I had something similar at an event last week and they were almost tasteless…is it the recipe or Grandma or I’m assuming…probably a bit of both? I don’t know that there is anything that has to appear every year except maybe for cinnamon raisin bread, the recipe I’ve been working on for quite a few years now. What wonderful memories!! 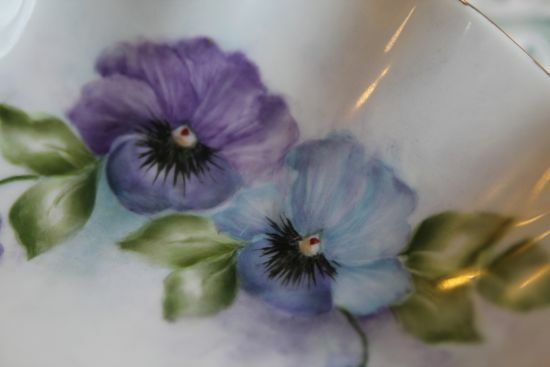 Love the beautiful china – a treasure. Our yearly holiday treats include Chocolate Mint Sugar Cookies and Chewy Molasses Cookies, among several others. Happy Holidays to you, Cathy. Love, Mrs. L. Slivovitz!? You make it yourself? I want to make that! I make cookies every year, several kinds. I make Russian Teacakes for myself. I also make my Grandma’s Chocolate Baking Powder cookies (very soft). My husband has to have chocolate chip cookies. And I make Ginger Molasses cookies and Gevulde Speculaas (spice cookies filled with almond paste). Then I branch out and become whimisical – maybe chocolate almond shortbread, or snickerdoodles, chocolate crinkle top cookies, various kinds of biscotti (orange/pistachio or pine nut/honey), peanut butter chocolate chip, florentines, rosemary shortbread, thumbprints made with nuts, or whatever else strikes my fancy. This year I also made drbabs cookies from Food52: orange-cardamom sugar cookies. They are very addictive! I always bring some to our local bookstore, give some to friends, and just have them for any holiday occasion. 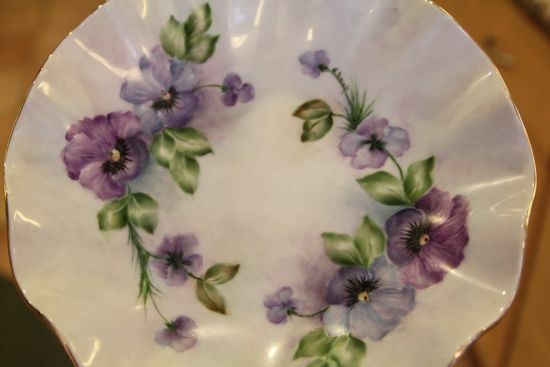 Sometimes I buy really nice plates at the local auction, pile the cookies on the plate, and give them as gifts. I’ve also been known to eat them for breakfast…. My husband married a Jewish vegetarian (me) so my Christmas tradition for him is to make a spectacular meat-food dinner for him and whoever else might be at our table. By the time the holiday is over he is ready to return to our veggie centered ways. My mother was a fabulous baker and made dozens and dozens of sugar cookies and gingerbread men every December but what I remember most fondly was her homemade Divinity, date and nut squares rolled into balls and then sugar, and Orange Rolls (a sweet roll dough filled with an orange filling rolled and cut the same as a cinnamon roll). The recipes came from the first edition Betty Crocker cookbook originally printed in 1950 which was her cooking bible. I had forgotten about Nuts and Bolts. I made them a lot when my now grown sons were small. My traditional cookies are Mexican Wedding Cakes, Peanut Blossoms, and Chocolate Chips. I also always make Puppy Chow and Rice Krispy Treats, cut with Christmas cookie cutters. That means there are lots of scraps for the cook to eat! This year I started making cranberry and pistachio biscotti, which is amazing and really easy to make. I made 6 and a half dozen yesterday for a cookie exchange. Mom always makes fudge, but our traditions are making cocoa with milk Christmas morning to drink while we open our stockings. Thank You for the recipe and lovely memory of your auntie. I had forgotten nuts and bolts, my mother used to make. Thank you for the happy tears. We make tons, tons, tons of hummus and deborah madison’s pita bread for parties and neighbors each holiday season. This year I bottled sixteen quarts of grape juice from our backyard grape vine–it might be a new tradition started. My family’s holidays aren’t officially here until we make Dodee Cookies. They’re just butter, flour, and brown sugar, topped with maraschino cherries or pecans. It’s a lot like shortbread. This year, I finally succeeded in making them gluten-free! Very exciting. The name comes from my great great grandmother, Dodee. She made them every Christmas. We also have tons of cookies around Christmas – I make trays for all our neighbors and friends – cookies, brownies, pecan pies. I would love to win a goodie package from you! Cathy, I love this post. Your Auntie sounded awesome. I love Lucy and Cross word puzzles. A women after my own heart. I have begun a new tradition with my husband. Two things he always requests are my chocolate chip cookies and my bourbon orange chocolate truffles. I try to surprise him with some unexpected treat between his birthday on the 15 th and Christmas. 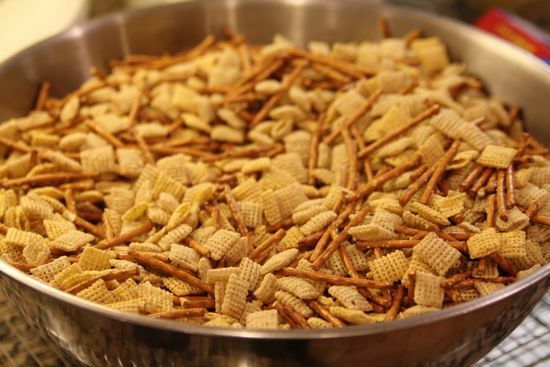 How did you know thatbid been planning to go look for a chex mix recipe all week and never quite got to it? This mix was always a holiday tradition in my parents house – and this year I’m going to make some for KM and I! My in-laws won’t let me come to Christmas unless I bring my homemade caramels (just kidding – I think). All I have time for this year is to make those and some truffles. It just isn’t Christmas without gingerbread cookies and cinnamon rolls. My holiday favorites are Cranberry Walnut bread and Jam thumbprint cookies. I’m excited that I’ll be baking both of these this week to take with us when we visit relatives. At our house the kids love homemade caramels, I love caramel corn and – to die for – the Brennan’s of New Orleans Bourbon Milk Punch! That plate is gorgeous, what lovely memories you have 🙂 Dinner at Pal’s Cabin in West Orange NJ was a Christmas tradition when I was growing up–it was my Aunt’s birthday on Christmas day and that is where we celebrated. I am not sure if it is even there anymore, I must check to see. We make chicken ala king and oyster stew every Christmas day. My grandfather used to be in charge of the oyster stew and he’d make it in his shop and slurp raw oysters as he made it. I think he had a system of one oyster for him, one for the stew. Merry Christmas, Cathy! We do Chinatown in NYC every Christmas day; we go to the same restaurant each each year–all the kids come in for it, and then we walk around Chinatown, Little Italy, Soho, the Village and we end up in Chelsea for coffee and… maybe even a hamburger for some! It’s a lovely day. Thanks for the great reminder how great ‘nuts and bolts’ are. We do the same reicpe only we add a few shakes of tabasco sauce to ours. If you leave out the pretzels they are a great gluten free snack. We need a recipe book with all of the above wonderful sounding treats and traditions!! I think our favorite treat is actually our Christmas eve meal. I’ve made lasagna every Christmas Eve for 20 years or more now. It’s always a big hit. We do also make those lovely glazed spiced pumpkin drops every year as well. The kids love them as much as the grownups do. The family tradition that has been passed down through generations is cookie making! Although we may add new recipes, we always make a double batch of Russian Tea Cakes. The tradition is fully operational, as this year my daughter has commandeered the choice of recipes! But umm back to the Slivovitz….. my best friends family, they taught me about Slivovitz. When I lived in Florida, I spent each holiday with them, and ever Holiday included Slivovitz. It is magical!! They would get it sent to them from their family in Serbia, and WOW, it was amazing!! I had never met anyone else who know about Slivovitz, I can’t believe you do!! And you make it!!! That is so cool!!! You are awesome!! Christmas wouldn’t be Christmas without all the baking. The treat I remember growing up is my mother’s pecan pie. It’s not the standard Karo filling. It has evaporated milk too so it has a custardy texture that adds to the richness. I have yet to find the recipe in a cookbook anywhere. And being from New Orleans, pecan pralines are a must. In my husband’s family, his mother makes apricot-filled hammentaschen, even though she’s not Jewish. They have a super flaky crust – definitely a pastry, not a cookie. As a matter of fact, she’s at my house baking some today. My sister and I try to make a holiday food gift to share with friends and neighbors. We vary the item each year and the fun is trying to determine if it is presentable enough to actually give away. We’re getting better at it! 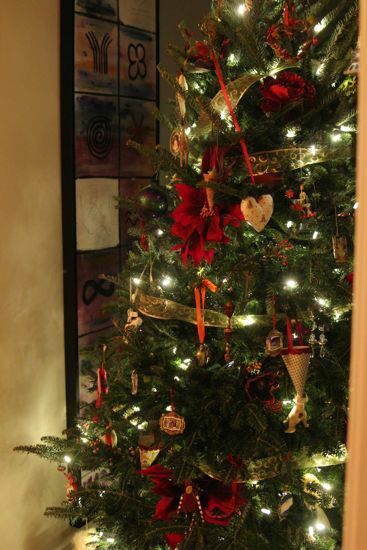 When I was growing up in the ’60s and ’70s, we’d decorate the silver aluminum tree, fire up the color wheel and open presents Christmas morning. Christmas dinner was a sort of Fourth of July picnic — cold fried chicken, baked beans, potato salad … Mom and Grandma cooked those foods the day before and served them picnic-style, so they could spend Christmas morning around the tree with the family, rather than in the kitchen. I still treasure the silver tree, which each year reminds me of my childhood. my favorite holiday is a savory one- speckuchen.We came from germany and my mother made these every year. they are a bacon turnover with little bits of onion and black pepper.I’ve started making them now and am finally getting it down. thanks for your blog and wishing you a delicious holiday! Moravian Sugar Cake is our traditional Christmas day breakfast must-have. Growing up in the piedmont area of North Carolina, the Moravian tradition of soft, warm dough spiced with cinnamon and sugar was the only thing I really wanted for Christmas. It still is — my mom tucked one in the freezer several weeks ago for us to enjoy this year! Homemade Peanut Butter Fudge, Diabetic Friendly Pecan Pie (for the diabetics), and Red Velvet Cake are our traditional desserts that we have at every holiday get together in our family. We always made some type of cookie, but we had very few traditions as my dad was often away from home til long after the holidays. Our traditions were more about what we did (like leaving our fake tree up til he came home) than what we ate. Cookies and I make lots of them about 300 (about 15 different types) I cook them after work. Worn out but everyone likes them. I always make sure that someone who doesn’t have family gets something. We all like cheer at this time of year. My grandmother’s cinnamon rolls on Christmas morning. I make them now for my children and grandchildren and I have no doubt the tradition will carry on long after I’m gone. My mom and sister and I have a cookie-baking day every year—most times I get seduced by new recipes to try, but my sister makes her same jello applesauce squares every year which are seriously retro. But my favorite holiday tradition is making my grandmother’s Italian wedding soup for xmas eve dinner and cheesebread for xmas morning. I always feel her and my grandfather close to me with those dishes on the table and smells in the kitchen. Homemade chocolate bark and loads of cookies. My partner and I made Italian cucidati the first year we were together and I convinced him, a Jewish guy, to help me make dozens of holiday cookies to distribute to friends. They’re incredibly delicious, made with a lovely, buttery dough and filled with minced figs, raisins, toasted almonds and walnuts, brandy, orange rind and honey – and topped with a touch of icing glaze. They’ve become the one cookie we never leave out and symbolize, for me, the way our love of food and cooking broached our two very different backgrounds. My sister, mother and I have had a Holiday Baking day for nearly 20 years now. Our baking must include Auntie Mar’s peanut butter cups and her recipe for peanut brittle that she has perfected over the last 75 years. We also make over 600 pieces of chewy caramel using a recipe that we have perfected over the last four or five years. This year we also made the recipe on your website for candied citrus peels and will be adding those to our baking list. In all, I made 18 different treats this year. My cookie boxes are filled and mostly delivered. What a great feeling to be done with a week to relax. And eat. We make a delicious appetizer called a Polish Mistakes ( I know not the most politically correct of names). It is made with a half pound of ground beef, half pound of italian sausage and a half pound of Velveta “cheese” on a cocktail rye bread squares. This year I am making a change to the tradition by mixing mexican chorizo sausage, roasted sweet potato, and goat cheese. I hope there aren’t to many people baulking at my change. Have a great Christmas everyone. Potato latkes, made with a mix of regular and sweet potatoes. And for a new tradition, while home for Thanksgiving I found my great grandma Ida’s recipe for rugelach in my mom’s recipe box. Recently made them for the first time and they are sure to become a tradition (again). christmas eve is time for everyone’s favorite food! chip dip, sushi, cracked crab, salami–whatever it is, everyone gets it. makes for a very eclectic delicious table! My grandmother would make Bizcochos at Christmas time, similar to Springerle but with a cinnamon sugar coating. Mom would make Empanadas and we always made Tamales (savory and also Sweet tamales were made) they were a must at Christmas Time, and since both my grandmother and dad owned restaurants – tamales were plentiful. Our neighbor who lived behind us owned a Greek restaurant so Kourabiedes and Baklava were always around too, and got incorporated into my Christmas cookies mix. As my parents and grandparents got older we ordered tamales and I took over cookie making. But when I married my husband about 30 years ago we began our our own tradition of making tamales (savory and sweet) for Christmas Eve. Blueberry muffins were a must for Christmas morning along with fresh squeezed orange juice, coffee and hot Irish tea to drink. We make a big spread for dinner with multiple desserts. My parents emigrated to this country from Asia, so I established most of my own holiday traditions. I baked many different kinds of cookies. Last year, I made over 20 varieties. I visit friends and give them bags filled with cookies, preserved items, such as jam, marmalade, or chutney, and liqueurs. It gives us a good opportunity to catch up and wish each other well. My mom’s eggnog. So thick you have to eat it with a spoon. Goes great with her German homemade Stollen. Now that my parents are older, my sister and I share Christmas morning breakfast with them. She brings a sausage casserole that she assembles the night before and bakes on Christmas morning. I bring caramel pecan rolls, also assembled the night before and baked in the morning. My father still has enough memory and skills to make his fabulous hot chocolate. With a little fresh citrus thrown in, it’s became the way we begin our Christmas morning! When I was growing up my mom would make us my great grandmother’s recipe for chocolate chip cookies for breakfast on Christmas morning. I wll never forget eating those cookies warm out of the oven before we opened the presents under the tree. What a nice offer! My grandmother used to make “Turkish Hats’ – the peanut butter cookies with kisses in them. And my other grandmother made corn casserole every year, always in the same dish, which is now in my kitchen, used for corn casserole every year. Sorry I missed the deadline for posting, but wanted to common anyway, on what a lovely tribute to Aunt Dorothy, and what a generous soul you are. Mexican wedding cookies, tamales, my grandmother’s chocolate-walnut fudge and a bog box of See’s nuts & chews were all Christmas traditions in our house. Have a wonderful holiday, Cathy!! Here I am so late to the party attending to my much neglected Google reader and finding the EXACT recipe that I was trying to find to make with Les Petits Chefs as a “take home” gift for their parents. I could not for the life of me remember what it was called (and in fact, In Australia it’s called something else but it’s essentially the same thing) but this is EXACTLY what I had in mind. Now I have the recipe, I need to get me some “Nutri Grain” cereal (from Aust) because that’s what we used instead of Chex. I’ll definitely be making this with the guys for Father’s Day next year 🙂 I also loved the story you shared here – my nana used to paint china too and it reminded me of her. What a lovely family tradition you have started to honour her memory. Wishing you and Dennis (and Louie) a fabulous, happy and healthy 2012! updated class schedule. winter 2012.